Deleted portions are struck through RED italic text like this sentence. To see the requirements, without the changes highlighted, Click here. Explain to your counselor the hazards you are most likely to encounter while wood carving, and what you should do to anticipate, help prevent, mitigate, or lessen these hazards. Show that you know first aid for injuries or illnesses that could occur while wood carving, including minor cuts and scratches and splinters. Earn the Totin' Chip recognition. Discuss with your merit badge counselor your understanding of the Safety Checklist for Carving. Explain to your counselor, orally or in writing, the care and use of five types of tools that you may use in a carving project. Tell your counselor how to care for and use several types of sharpening devices, then demonstrate that you know how to use these devices. Tell why different woods are used for different projects. Explain why you chose the type of wood you did for your projects in requirements 6 and 7. 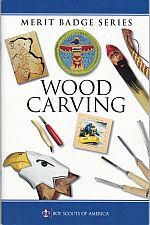 Plan your own or select a project from this (the Wood Carving) merit badge pamphlet and complete a simple carving in the round. Complete a simple low-relief OR a chip carving project.